The VS12SO-QC-LF from Everhot is a 1/2” Sweat x 3/8” OD Compression Straight Stop (1/4-Turn), Lead-F.. The VS580CO-QC-LF from Everhot is a 5/8” OD Compression x 3/8” OD Compression Straight Stop Valve (1.. The 29-1004LF from Matco-Norca is a 1/2” Threaded Inlet x 3/8” OD Straight Stop Valve (Multi-Turn), .. The VS14C0-LF from Everhot is a 1/4” OD Compression x 1/4” OD Compression Straight Stop Valve (1/4-T.. The 29-1010LF from Matco-Norca is a 1/2” Sweat x 3/8” OD Compression Straight Stop Valve (Multi-Turn.. The PXSVS-QC-LF from Everhot is a 1/2” PEX x 3/8” OD Compression Straight Stop Valve (1/4-Turn), Lea.. The 29-1014LF from Matco-Norca is a 5/8” OD Compression x 3/8” OD Compression Straight Stop Valve (M.. The PXPSV-QC-LF from Everhot is a 1/2” PEX x 1/2” PEX Straight Stop Valve (1/4-Turn), Lead Free. It'.. The R14X-R from BrassCraft is a 1/2” Sweat x 3/8” OD Compression Straight Stop Valve (Multi-Turn), R.. The R14X-C from BrassCraft is a 1/2” Sweat x 3/8” OD Compression Straight Stop Valve (Multi-Turn), L.. The OR12X-C from BrassCraft is a 1/2” FIP x 3/8” OD Compression Straight Stop Valve (Multi-Turn), Le.. The G2CR14X-C from BrassCraft is a 5/8” OD Compresssion x 3/8” OD Compression Straight Stop Valve (1.. The KTR12X-C from BrassCraft is a 1/2” FIP x 3/8” OD Compression Straight Stop Valve (1/4-Turn), Lea.. The KTR14X-C from BrassCraft is a 1/2” Sweat x 3/8” OD Compression Straight Stop Valve (1/4-Turn), L.. The KTCR14X-C from BrassCraft is a 5/8” OD Compression x 3/8” OD Compression Straight Stop Valve (1/.. 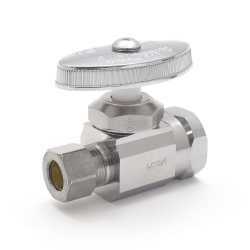 The G2PS14X-C from BrassCraft is a 1/2” Push Connect x 3/8” OD Compression Straight Stop Valve (1/4-..